Dr. Babacar Fall, a fellow at The Nantes Institute for Advanced Study in France, and also the Chair of the History and Geography Department at Cheikh-Anta Diop University in Dakar, Senegal, and Oumar Tall, a digital archivist at the National Archives of Senegal, visited the Hoover Institution Archives on April 13th. 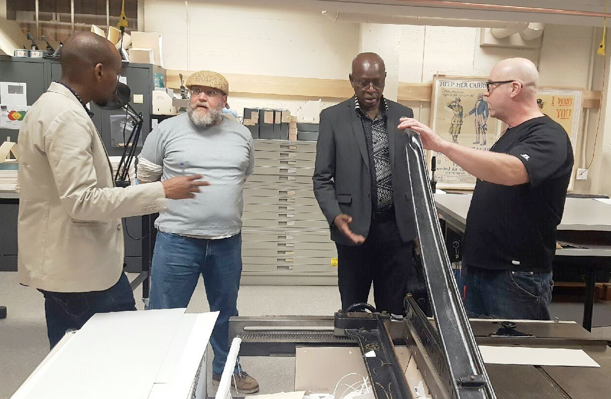 Their visit included viewing the George D. Jenkins papers (containing research materials on Ibadan and Dakar) and the Senegalese Subject Collection. During their visit, they also toured various departments at Hoover. The delegates were visiting Stanford campus for a conference entitled "African Colonial Employees Project Workshop: A Digital Archive Initiative." The conference brought together an international roster of scholars and archivists, and was co-hosted by Stanford's Center for African Studies (CAS), the Department of History and Geography, Cheikh-Anta Diop University, Dakar, Senegal, and the National Archives of Senegal.